The Centre is open 6:00 p.m. to 9:00 p.m. daily, (except Sundays) when ocean-going ships are in port. The Centre can be opened at other times with a minimum of 1 hour notice by contacting the Centre. The Centre is beside the guard hut at Keefer Intermodal, 100 Main St.
ecumenical partners. The Mission is staffed with a part-time Chaplain and volunteers and funded by donations. Services available to seafarers on lakers upon request. The chaplain is on call if seafarers need assistance. Contact him if you need someone to talk to, or to help you contact family, agencies or clergy of your own faith group, or if you would like to arrange a mass or worship service aboard your ship. The chaplain or a volunteer visits ocean-going ships in the afternoon. Our van takes up to 10 seafarers. Call the Seafarers’ Centre (807) 344-8241 a minimum of 1 hour before you would like to be picked up. 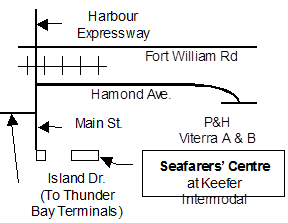 Seafarers should wait for a pick-up at the gate of the elevator; for Thunder Bay Terminals in the Taxi and Visitor parking lot. If the ship makes an appointment for a pickup, and seafarers chose instead to take a taxi, the ship is expected to cancel the appointment. Failure to cancel means the Mission is not obliged to provide transportation. A child under the age of 8 requires a children’s car seat. When there is a child to transport, advise the chaplain so that the car seat may be put in the van prior to the pick up. The driver may refuse to transport a child without the children’s car seat. The wi-fi can be accessed in the Centre or outside of it. The password is posted on Centre’s living room window. Bus Fare $2.75 exact cash. During the summer, mass schedules may change as priests may be on vacation. For other faith groups contact the chaplain for information.